Before 2010, I could have counted the number of times I have eaten in Clerkenwell on one hand. And on one of those occasions, KFC was involved, enough said really. I never really had any impulse to go and visit it, nor had any reason. If someone came up to me and said that Clerkenwell was the heartland of some great food, I would have guffawed in their face. But in my eyes, one establishment rises above all others, The Eagle. Revered by many as the original gastropub, and part of the group which runs the Anchor and Hope down in Waterloo and Great Queen Street in Holborn, it changes it's menu every day depending on what produce they can get, as well as a few staples that are on the big chalkboard daily such as their steak sandwich. I've visited on multiple occasions now and every time I go, something draws me away from that elusive steak sandwich. 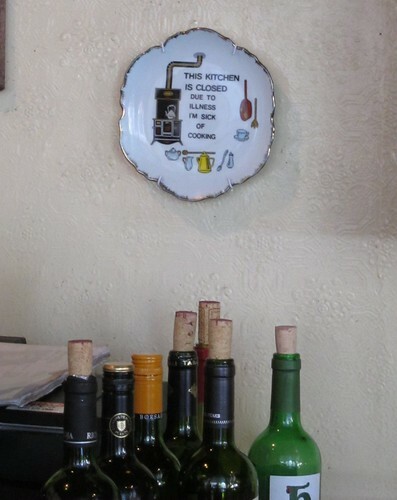 The menu chalked up behind the bar and over stoves features about seven or eight choices, all as mouthwatering as the next whilst having a small selection of "tapas" which are essentially small sharing plates. I remember the simply cooked chorizo in wine fondly and always look out for it if it's on the menu. On my last visit, the steak sandwich was once again overlooked as myself and Naomi from the Ginger Gourmand opted for salmon, mackerel and pork. The little smoked salmon "tapas" was a generous portion of excellent smoked salmon with a dollop of creme fraiche and a squeeze of lemon. No airs and graces, just great food. Served with a little basket of bread and olive oil, the preparation got a bit messy as we doused the bits of bread in oil. Messy but worthwhile. 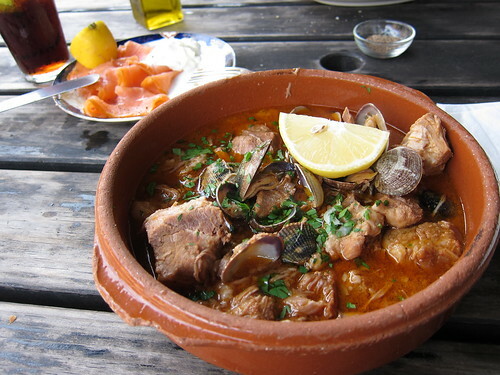 For mains, I had opted for a basque inspired stew using clams and pork. The stew arrived wafting it's deep aroma of paprika and pork in a light red stew. Each chunk of slow cooked pork broke apart with a touch from the fork, and combined with the gelatinous clams which had escaped it's shells, formed a delicious mouthful, full of different flavours and textures. Naomi opted for the mackerel with rhubarb and chill jam. Served whole, the meat had to be carefully prised away from the bones, but the freshness evident as soon as you put it into your mouth. The jam was an interesting addition, but the tartness from the rhubarb and the subtle burn from the chilli complemented the fish well. The Eagle is a great restaurant. It serves excellent fresh food and it is unsurprising that it is so popular. 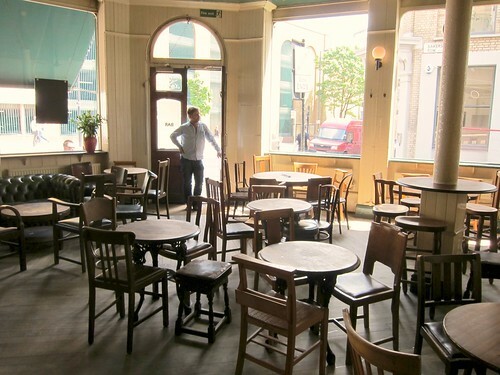 Inside, it still maintains an aspect of rusticity with mismatched wooden tables and chairs, trying hard to maintain a semblance of being a pub. Although it is an enjoyable place for a drink, there is no real doubt that this is a place to eat, and a very good place at that. One day I will get round to getting my chops round that steak sandwich! I dunno. It doesn't look that appetizing to me. It's like it threw in random ingredients together in a pot. I guess it's part of their appeal. If you say they're good I'll take your word for it. But I don't think I'll visit them anytime soon. I live in the area and, although I like the Eagle (they also serve Hoegaarden, which is a plus! ), I think there are better options - The Coach and Horses and The Peasant as pubs, and now Caravan, which is a great addition. Next time I am in London I will look it up. Thanks for that. I've walked past The Eagle on so many occasions, but for some reason I have never felt the need to venture inside and taste the food. I imagine it is one of those places where you either love it or hate it. But as with Megan, I will take your word for it and may give it a try. Clerkenwell definitely has its fair share of decent eating places. 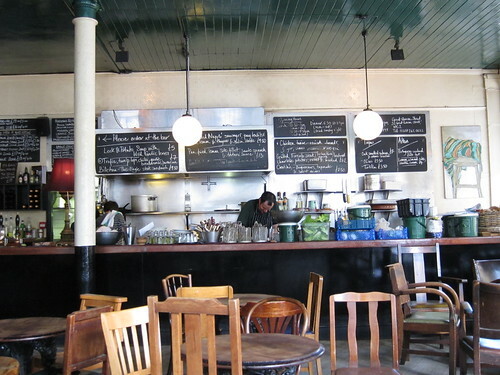 Have you tried out Bistro Bruno Loubet at The Zetter Hotel? Even though I'm not really into French cuisine, that place makes it... well, rather accessible to the masses for the lack of a better phrase. @Megan - Looks can be deceiving. It serves great food at affordable prices in a comfortable environment. Definitely don't rule it out! @Emyr - You are certainly spoilt for choice in the area. I've been to both Coach and Horses and Caravan which are both very good, but I enjoy the vibe and simplicity of the Eagle. @Tobias - No problem, definitely worth the effort. @Dave - I agree with you on the marmite analogy but you will never know until you try it. Let me know what you think when you finally make it. @London Chow - BBL is one of those places I never quite get to. Definitely high up on my list. 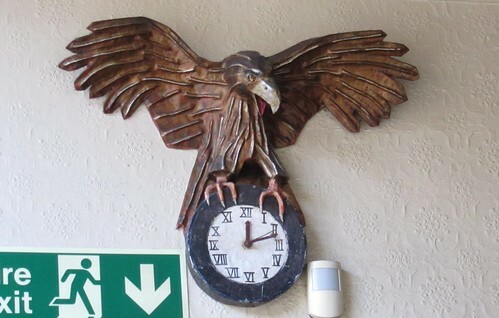 The Eagle has been the first place on my wishlist when I created it ... and it still is .. One day, I will go.. That's for sure! Mathilde - you must go - it is good food and also gives you a real insight into the whole 'gastropub' thing (one of the few homegrown and lasting 'English/British' foodie phenomena). The steak sarnie there is the second best in Clerkenwell after The Gunmakers and runs it really close. My only gripe is that The Eagle can be a victim of it;s own success and be VERY busy. That and the fact there isn't a great selection of beers. Those are minor points though because it is a great foodie pub. I'm glad you've put Clerkenwell on your foodie map - there is much here to recommend it, not least Eastside Inn. I still drool over the tarmasalata I had at the Eagle two years ago or so with Ben and Howard from Food & Drink. Excellent stuff. Haven't seen it on the menu since, sadly! Mmm - pork and clams, a great combination. Shame Clerkenwell is too far for me to go a-lunchin'.